This giveaway is now closed and the winner has been announced. What is your favorite color? Leave one comment below. Do you follow my blog? Please leave a second comment. This giveaway ends on Friday, December 16th, 2011. One lucky winner will be chosen randomly. International entries are welcome. My favorite color is red, it's so joyful ! What a great gift you are sharing. Thank you so much. My favorite color is blue and always has been. I love the blues in this new collection. And I am a regular follower! And I'm a follower ! I am so very happy to say that I am a follower of your blog. Thanks for such a great source of inspiration. And yes, I follow your blog. You always inspire me. Thank you for participating in the giveaway. I have a lot of favorite colors! Too hard to pick just one. Let's say today it's blue! i follow your blog via google reader. thanks for the giveaway! And I am a follower!! Thanx for hosting the Give Away!! One of my favorite color is pink in all shades ! Thank you so much! My favorite color (at this point in time anyway is green! OMG I'm breathles!! The entire collection it is so beautiful to be true :D.
My favoruite color is yellow, but well it depends on the day maybe tomorrow will be green. I pretend it's aqua, but I really love pink. Thanks for the chance! My favorite color is purple...have liked that color since I was a child! I love love love this line- it is my fave Joann's line yet! Bonus- I've been a follower for awhile now! Favorite color is definitely purple! Let's see....favorite color...would have to be blue. That is, if I only get to pick one. Though there are LOTS of others I could gaze upon for hours! My all time favorite color is RED. I love this collection! Today my favorite color is orange-it changes often :) Thanks for the great giveaway! Thanks you for this great give asway! What an awesome fabrics you are going to give away! I love the color green. Thank you for the wonderful give away chance. Happy Holidays! Purple is my favorite color. - thanks for sharing! I feel kind of cliche claiming it right now, since Pantone just announced it as the color of 2012, but I love orange! And thank you so much for the giveaway! I keep eyeing these when I go notions shopping, but haven’t had a chance to buy any yet. I'm a follower. I love your work. I am a follower, indeed! Today my favorite color is orange! Green and it is the biggest pile(s) in my stash. I so want this fabric as an addition to my Picnics and Fairgrounds bundle! Thanks for the giveaway! Wow - these fabrics are soo wonderful! very cute! my favorite fabric colors seem to always be pink...! I really like aqua. And yellow. My favorite color is green. I love DS...thanks for the chance! And I am a follower too. My favorite collor is bright yellow. That color makes me happy. My favorite color is Green. Green and I are in love. Seriously. I just got the DS quilting book from Chronicle Books, so this would be great to use with it! My favorite color is yellow, I love to wear green, blue and brown. I follow blog! Thanks for the awesome giveaway! My favorite color is turquoise--or maybe lavender! It changes by the moment! I really love orange--in all shades. My favorite color is blue... but like my little boy, I really like "all the colors of the rainbow". My favorite color is purple!! But I still love these prints. Oooh, thanks for offering these up! We don't have Jo Ann's in Canada so I'd love to get my hands on these. My favourite colour (of the moment)...grey! Happy holidays! Blue! Thanks for the chance to win. What an exciting give away! My favorite color is green in all it's wonderful shades. My favorite color is blue - but my favorite quilts are red and white. Purple ...love it! Thanks for the chance! I do follow your blog...in Google Reader. Merry Christmas!! My fave colour is gray with anything. And purple. And blue. OMG, this is a super giveaway!. I love green. Thank you for the chance. Oh these are gorgeous fabrics aren't they. My favourite colour is the many shades of blue! My favorite color is blue. Especially country blue. I am a new follower. I adore your quilt Love, you have very good taste selecting fabrics. My favorite color is green. Any shade of green will do. I love them all. My favorite color is the one Kona calls cerise! Always my fall back color! I'm a follwer & fan & love your giveaway especially since we don't have Joanne's here! I love purple. The deepest purple you can imagine! My favourite color is orange. But anything in the range of warm colors always do. oh wow fantastic giveaway! My favourite colour just now is mustard yellow. What a give away! Thanks so much! My favourite colour is blue! I don't have a favorite, I love all colors! Thanks for the giveaway! I am a follower! Your blog is fanastic! Awesome. My favorite color is usually green but I can go for a real purty yellow too. I'm a big fan of purple. Thanks for the chance to win some DS fabric! My favorite color is burnt orange. My favorite color is chartreuse! The colour that I love is red, red, red. My favorite color is periwinkle blue. Thank you for a very generous giveaway. I'm really loving slate grey lately, does that count as a color? I love black and white together. Or yellow. Oh....I love so many colors, but I will have to say BLUE!!! Yep...I happily follow your blog. LOVE IT!!! At the moment I will say mustard, but this changes so quickly. 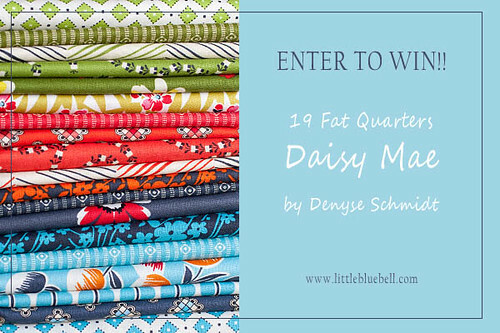 Thank you for the chance to win such amazing fabrics! Green is my absolute favourite colour. Ever. PS Let it be me, Please! My favorite color is an icy grey. Thanks for the chance to participate! I DO follow your blog. Lovely stuff! Thanks for sharing, and enjoy giveaway day! Thanks for the generous giveaway! I love this line, and I've just been hoping someone would give some away! My favorite color has been purple my whole life, and I still love it! I'd love to win these since we don't have Joann's in Canada! My favorite colors are yellow, green, aqua, and red! and I'm a follower of your blog. Lately I'm loving Aqua. Thanks for the chance to win! I also follow your blog (via Google Reader). Awesome! I love this collection and would love to have it! I seem to use aqua in almost all of my quilts so I guess it is my favorite color! My favorite color is anything in the red family from pink to maroon. I love all colors but will have to pick blue as the overall top of my list long standing favorite. Hmmm, my favorite color is blue, evidenced by the number of blue fabrics in my stash! But I also love red, green, yellow, orange, pink, purple.......you get the picture? Love the orange, i love them all, i am in the netherlands so it is hard to collect them all, so fingers crossed!! I'm a fan and now a follower! My favorite color is blue in all of its variations. My favorite color would have to be aqua. I am just drawn to all shades of aqua. I am a follower of your blog. Thanks for the great tutorials! I'm a follower. I receive your updates by email. my favorite color is eggpland! I don't have a favorite color-I like almost all of them. I just like color! I follow your blog w/ google reader . thanks again! Wow, that's a generous giveaway. My favorite color is teal - has been for aaaages! I love them all but since you are asking for one, I'll have to go with orange!! My favorite color is Blue, all shades of Blue.